The Bitcoin (BTC-USD)(COIN)(OTCQX:GBTC) Value Indicator has proven very useful for identifying the tops and bottoms of Bitcoin bubbles thus far. However, some questions have been raised about how to use the BVI in relation to the Z-scores of metric outputs. By simply taking the price/predicted for each of the three inputs (hash rate, unique addresses, total transactions), we can create an easy to use tool that makes it clear what state the market is in. By identifying the current state of the market, you will be empowered to make buying, selling, or holding decisions. In case you haven’t read any of my Bitcoin Value Indicator reports, you can get caught up here. The idea is that since Bitcoin is a log scale phenomenon, and the organic growth of the network can be modeled using several proxies, then we can estimate a range of values that may be appropriate by using this data and creating meaningful visualizations with it. It turns out the hash rate of the network, the number of unique addresses in use, and the total number of transactions are each highly correlated with the Bitcoin market cap. The Bitcoin Value Indicator, or BVI, uses that data to generate an expected market cap and then compares that with reality (the actual market cap). Interquartile Ranges – What Are They? In statistics, sometimes you want to know how a specific measurement stacks up to an entire whole data set. For example, if hourly wages in the USA are between $3 and $500, where does someone fit who makes $20 per hour? Using this methodology, you can produce cool looking charts like this. 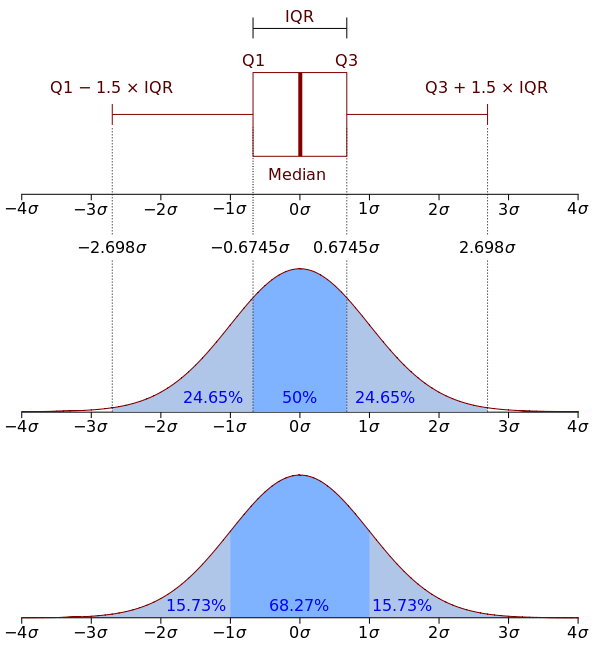 The IQR is the middle part of the box plot above. However, if we also mark the high and low observations, it gets even more interesting. Each input metric in the BVI takes a certain set of data, transforms it, and then compares that against the Bitcoin market cap. The output of the regression formula yields a prediction that is compared against the real world. What I did was to take the low, first quartile, second quartile, third quartile, and the high of the price/predicted and graph it for each of the three inputs. This was the result. The legend at the top of the chart shows you which color corresponds to which quartile. The blue color is the low, and the red color is the high. The high and the low form the boundaries of our data. In other words, the market cap has never been higher than the red color or dipped low enough as to go into the blue color. The black line represents the Bitcoin market cap over time, and you can see which quartile the market cap is in at any point in the past. The market cap is defined as the average market cap of Bitcoin (the number of BTC circulating times the price in US Dollars) for the entire month. Right now, using the hash rate input, we’re in the Q2 band. With a quick glance, we can see where the black line sits in the color matrix. Note that the matrix itself changes over time, meaning that a price in isolation is not high or low, unless we also add in the time the sample was taken. The market cap of $1 Billion in 2013 was high, but in 2018, that same market cap would be off the charts low (maybe impossible unless the system itself were to completely fail). Black line in the Q1, the 1st quartile. This is the ideal time to buy. Black line in the Q2 region. The price is slightly lower than anticipated. Black line in the Q3 region. The price is slightly higher than anticipated. Black line in the “High” region (or 4th quartile). This is the ideal time to sell. Keep in mind that the BVI has three input metrics. Each metric will produce a different scale of quartile ranges. Let’s move on to the next input, Unique Addresses. Recall that the approach using unique addresses is a much more pessimistic approach. Let’s have a look. Notice how this approach puts us in the “high” quartile, or Q4? This is different from the hash rate breakdown by a significant margin. So, which one is correct? Let’s get a third opinion from the total transactions. If the number of transactions does not increase, we have a problem. Let’s get a gander here. The total transactions approach puts us right between Q2 and Q3, or if you’ve been paying attention, smack dab in the middle of the IQR. Notice that this metric is much more stable than the unique addresses. Perhaps it’s less responsive to change, or maybe it’s just a better tool for making long-term decisions? Charts are great, but I know some of you are itching for a bland table full of data. So, for those of you in this group, here you go. These are the quartile range predictions of the Bitcoin market cap by data type. The data is current through the end of September 2018. Sometimes a picture is worth a thousand words. We have all the raw data, the issue is understanding what it is and what it might mean. By placing a floor and a ceiling on the predictions of each input, we can more easily understand our current state. I’ve built these charts using the price/predicted, without using any Z-scores in order to simplify the model. At the end of the day, I don’t think it makes as much difference as the giant leap between having an understanding and not having an understanding. A final note about using these IQR ranges, the black line in the green is the buy signal. It’s possible to have all three black lines in the green, or just one, etc. Right now, we have zero black lines in the green. Translation: we are not yet at the market bottom. If you’re entering into the market now, do it slowly. In terms of the BVI signals, this means we’re “overbought.” All three lines in the green would be an “oversold” signal. This article was submitted first in Crypto Blue Chips.